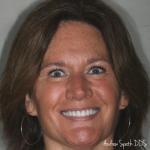 This patient came to our office after a few months in orthodontics with Dr. John Digiovanni. He was born without a lateral incisor and in an effort to close the space he had a dental midline that was off center. Additionally because he had more teeth on the bottom and a previous orthodontist closed the gap where the missing lateral incisor was on the upper arch the bite did not align well (malocclusion) and significant wear occurred. Dr. Digi did a great job opening the space back up where the lateral incisor was missing. We then did a dental implant in that space. The lower teeth were so significantly worn and short that we did esthetic crown lengthening and cosmetic bonding to add back length. On the upper teeth during orthodontic treatment we bonded the edges to communicate with the orthodontist so he would know our eventual desired length of the teeth. The results were done in a very natural shade, per the patient request, and the display gives this patient the smile that they were born without. This whole case was done in less that one year.